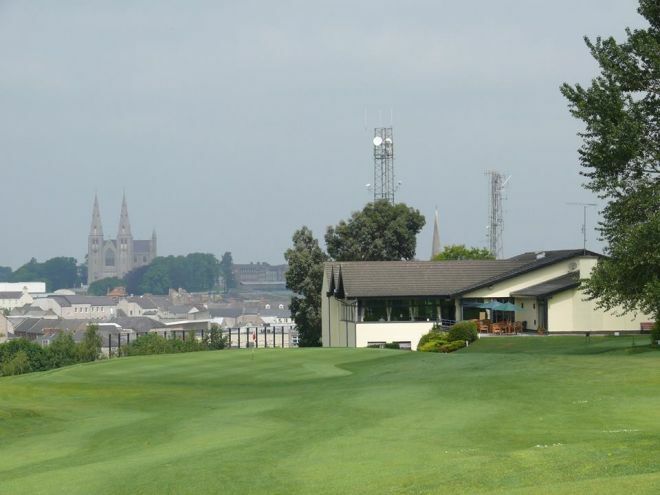 Co. Armagh is one of the oldest golf clubs in Ireland, founded in 1883. It was a 9-hole course until 1975 when it extended to 18-holes retaining only six of the original holes. In 1976 Christy O’Connor "Himself" played an exhibition match against the recently appointed professional Billy Todd who shot a 68 to beat the great man. Co. Armagh Golf Club is a short but tough test of golf, measuring 6,212 yards Par 70 with a standard scratch of 69 off the white tees. The most difficult holes are the 403 yards 5th requiring accuracy off the tee and a steady nerve down an alley of mature trees. The 446 yard 16th is a tough hole with the green guarded by two lakes. The Ladies of Co. Armagh Golf Club won the Ulster Final of the Ladies Challenge Cup when they beat Donnaghadee Golf Club by 3-matches to 2-matches in the Ulster Final at Dungannon Golf Club on Sunday 28th August 2016. They were led out by Anne O'Reilly who beat June Simpson by 5 and 3, she was followed by Jacqueline Kelly who lost her match by 6 and 4 against Brooke Stranaghan, she was followed by Eilish Grimes who beat Janet Adams by 3 and 1, the penultimate match of Sheila Stinson went 2-up to Angeline Gordon in the bottom match Sylvia Ashe had a 3 and 1 win over Fiona Hicks and with it a place in the All-Ireland deciders at Dundalk Golf Club. They made their way to Dundalk Golf Club and drew Munster Champions Ballybunion Golf Club on Friday 23rd September in the All-Ireland Semi-Final. They were led out again by Anne O'Reilly who beat Mary Hickey Keane by 6 and 4 she was followed by Jacqueline Kelly who lost her match against Margaret McAuliffe by 3 and 2, next on the tee was Eilish Grimes who halved her match with Elva Clancy when called in, in the penultimate match Sheila Stinson lost out to Dori Cotter by 3 and 2, in the bottom match Sylvia Ashe lost her match against Tess Noonan by 3 and 2. Ballybunion Golf Club went down to Headfort Golf Club by 4½-matches to ½-match in the All-Ireland Final the following day. Co. Armagh beat Ennis in the final of the 2006 Cidona Inter-Club Championships at Balbriggan, Tuesday 29th August. Earlier in the day, Co. Armagh saw off Co. Sligo in the second semi-final while Ennis beat the defending Champions Kilkenny in the first semi-final. The Girls’ from Co. Armagh Golf Club won the All-Ireland Inter-Club Championship at Balbriggan Golf Club on Tuesday 29th August 2006. They beat Co. Sligo in the All-Ireland Semi-Final by 2 and halve matches to a halve match in the morning. They met Ennis in the afternoon when they won by 2 matches by 1 match. Co. Armagh Golf Club were County Champions in the J. B. Carr Diamond Trophy in 1997, 2000, 2003 and 2004. Mr. Charles Burke introduced golf to Co. Armagh. He had his own private golf course at Ballinahon House, where he used to invite his friends to play. They decided to form a club, and asked Mr. George De La Poer Beresford for the use of his land, which included the Primate’s Palace. The club was founded on 15th September 1893. The opening, ceremony was performed by Mr. Maynard Sinton, the High Sheriff of the county. It was a nine-hole course, playable only in the winter from 12th November to 12th May. In the last decade of the nineteenth century Mr. Charles Burke of the Folly House, returned from holiday as a most enthusiastic convert to the game of golf. "TRESSPASSERS PROSECUTED - OFFICERS AND DOGS SHOT ON SIGHT"
Mr. Burke's enthusiasm encouraged others who formed the opinion that Armagh should have a proper course. Mr. J. C. Murphy of the Belfast Bank and Mr. C. W. Bower of the Northern Bank took it on themselves to inspect every possible site. They agreed that the most suitable location was the Demesne. Mr. George de la Prev. Beresford gave the use of the land from November to May, rent free, if a club was formed. The members of the Armagh Archery and Lawn Tennis Club called a meeting in the Courthouse, September, 1893, and it was decided to form a club. Logan, the Belfast professional, came to lay out the course, and Mr. N. L. Townshend, R.M., collected money and built the first clubhouse. Co. Armagh's oldest trophy, the Lonsdale Cup, was presented in that year by Mr. Dunbar Barton, M.D., and Mr. J. B. Lonsdale, afterwards Lord Armaghdale. From such beginnings emerged Co. Armagh Golf Club, which by 1931 had 103 gentlemen members and 91 ladies. Early Councils had the task of caring for demesne land in an appropriate fashion so Council reports of the period are pitted with notices such as (April '28) "that the cost of grazing for all cattle except milch cows for the coming season shall be as follows: Yearling to 2 yr. olds 35/- 2 yr. olds plus, two pounds fifteen shillings and sheep 2/- per month." The audited accounts for May, 1931, list as assets 48 sheep, 2 rams, 60 lambs and 1 horse. A dynamic tenure of captaincy (1931-32) by Capt. Noel Smith served to rescue the club from a shaky financial position and placed it in credit for years to come. A remarkable ballot for an Austin 7 H.P. Saloon realised the princely sum of five hundred and fifty pounds plus and erased all debts. Such was the Captain's popularity that personal subscriptions from members bought the Smith Cup as a perpetual reminder of his success. This period also saw the association of many familiar names with Co. Armagh golf, names such as Hirsch, Cowdy, Woods, Emerson and Forbes. Co. Armagh continued to gather enthusiasts and the work of S. G. McVitty, N. R. Anderson, T. McKenna, W. McCartney, D. S. Hyndman and others ensured by the late 1950's, that Co. Armagh was established with leased land, open twelve months of the year, and possessing a creditable nine-hole course. In February, 1971, a special meeting of the Club agreed to the most imaginative development programme undertaken since the Club was formed. Prime movers at the debate were two men, P. G. Toner and F. McAvinchey, who linked the club of the 70's with three decades of club history. A development committee of P. D. Corrigan, J. F. Maxwell (Hon. Sec. ), J. H. O'Rorke and later Ian Donaldson carried the plan to a successful conclusion. A twenty six thousand pound "temporary" clubhouse providing all modern amenities, not least of which was a dining room capable of seating 200, was erected. An 18-hole golf course, some 6,043 yds., par 70,s.s. 69,with watered grounds, strategic bunkers and situated in one of the most pleasant scenic areas of Mid-Ulster, was opened on 3rd May, 1975. Tragedy struck Co. Armagh Golf Club when, on the night of March 25th 1980 the clubhouse was reduced to ashes by a series of bombs - another statistic in the troubled period of Northern Ireland's history. 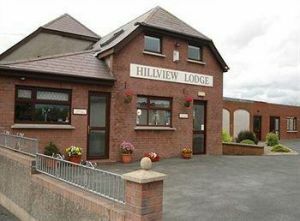 A new development Committee under the chairmanship of Mr. J Maxwell set about planning a replacement building and in 1982 the re-designed Clubhouse was officially opened. Since then the building has been further enhanced with better facilities added and refurbished to a very high standard. The Club, amongst the oldest in Ireland, celebrated its Centenary in 1993. A detailed, illustrated book on the history of the Club, tracing its development alongside that of the City of Armagh itself over the past century has been produced and a few copies are still available from the Secretary's office , priced £10 plus postage.